If you are going to be a guest at the wedding this Winter, then you better get ready soon. In today’s post, I want to draw your attention to the best winter wedding guest looks and style ideas to try on this year. Yes, it can be quite tricky to figure out what to wear, as you need to create an outfit that is both comfy and chic and doesn’t look perverse. My personal advice: NEVER go for a totally black outfit, as it looks boring and somewhat offensive. You are at the wedding not at funeral after all. So, what’s on your mind to wear to the upcoming event? Everything depends on your style, that’s why you better take a close up look at some of my favorites and let me know your thoughts in the comments below. The first idea is to try on romantic outfit. Keep things cute and sweet by wearing soft and feminine outfit. This is your chance to show off your evening dress and pretty heels. You can either keep things less or more formal. Try beautiful lace, pearls and soft colors. If you are more into retro glamour, then you might like to try on retro glamour diva look. This is a perfect choice for retro-themed weddings, but you can use it also if the wedding is classically themed. Think of sequined, relaxed-fit tops tucked in pale yellow pencil skirts, Prince of Wales printed suits, jacquard shifts and pretty cocktail frocks complimented with vintage hats. In love with those fun details, colors as well as fur accents. If you are into something more sophisticated, then the best way is to try on posh and classy outfits. Forget about LBDs and think of something red carpet appropriate. Imagine all your favorite celebrities and actresses. You can try on pale blush relaxed fit frocks, cut-out lace tops, wide-leg pants, pale yellow maxi gowns, etc. If you haven’t found inspiration, then the best place to find it is to look through royal weddings. How about Duchess of Cambridge looks? Kate Middleton is a perfect lady for getting inspired by. That’s a fabulous look featuring a shiny sequined silver slouchy blouse tucked in light yellow high-waisted pencil skirt. The outfit is completed with a light yellow turban, yellow straw clutch bag and blush heeled pumps. By the way, I also made a post about beautiful pencil skirts and simple fashion ideas how to wear them this year. Check it and tell me your thoughts. Wide-leg high-waisted pants ideally match the sheer-perforated black top. I made a post about what women’s pants are going to be in style this Spring, check it, as there are plenty of cool ideas to get inspired by. Do You have any thoughts about Winter Wedding Guest Looks? 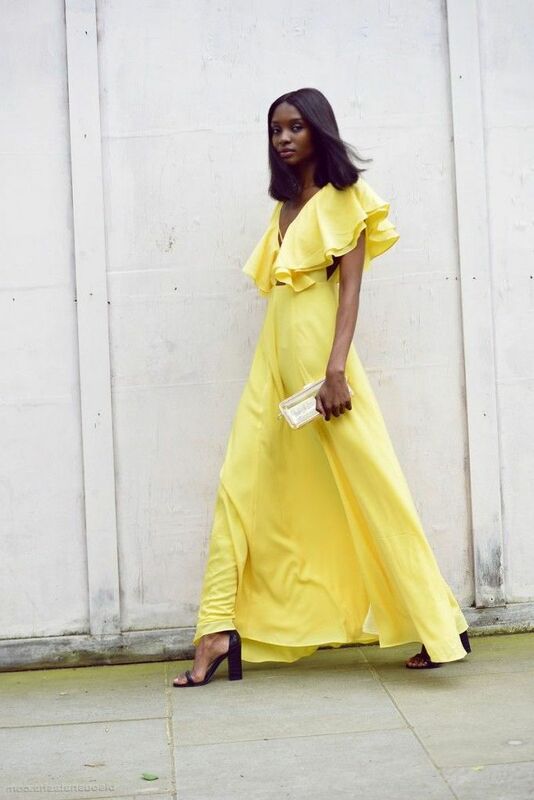 Here are Fashion Tips pictures and trendy women’s outfits which are in style in 2019: Must Have Fashion For Winter, Retro Style, Romantic Clothes, Wedding Clothes, Wedding Guest Clothes, Winter Weddings and tips on how to wear them on the streets.